Will there be another season of Divorce? Recently, HBO boss Casey Bloys spoke with Deadline about the future of the TV show. 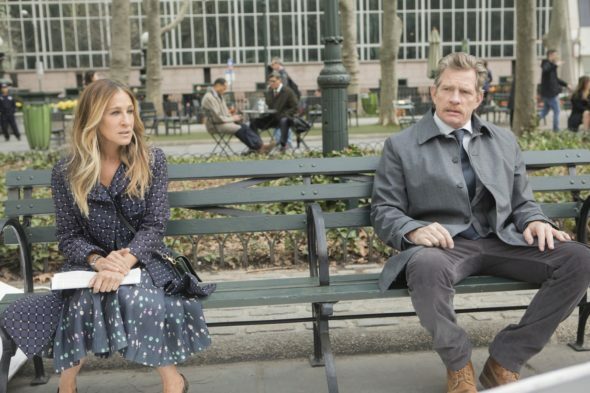 The comedy-drama centers on Frances (Sarah Jessica Parker), a middle-age woman who breaks up with her husband, Robert (Thomas Haden Church), the father of her two children. The cast also includes Molly Shannon, Talia Balsam, Tracy Letts, Sterling Jerins, and Charlie Kilgore. Bloys later said HBO will make an official renewal decision made by later this summer. What do you think? Have you seen Divorce? Would you watch a third season? The others are right, there is a ton of crap out there to watch. Divorce was a bright spot on an otherwise empty line-up! Keep the show, the writers are brilliant, the acting very entertaining and after the season finale it was all set to bring in new characters and story lines. Its a no brainer! You shouldn’t get rid of Divorce!!! YES, YES, YES! PLEASE. I REALLY ADORE SARAH JESSICA PARKER, AS AN ACTRESS AND THINK SHE’S JUST TERRIFIC IN THIS WONDERFUL SERIES! THERE IS SO MUCH “JUNK” OUT THERE, ANYMORE AND THIS SHOW IS ONE OF MY TOP FAVORITES. It’s a tough one. Definitely not a real comedy but yet not a complete drama. Love the actors so hope it can be worked out to give us one more season. I love everything about Divorce: the actors, the script, the characters. It’s the best, most entertaining, intelligent series on television. I will definitely watch season 3 and any other seasons of Divorce. Holding out hope it will be renewed! Hollywood is most of our enemy. We love Trump. Best Pres ever.